Do you have any idea how excited I was to read this book when I first saw it on blogs? VERY. Do you have any idea how thrilled I was when I finally bought this a couple of ago? INSANELY. Do you have any idea how many times this book gave me the creeps while reading it? TOO MANY. Do you have any idea how long this review has been on draft? A MONTH. The thing is Splintered had me feeling all sorts of really strong emotions, both good and bad, from the moment I saw it on blogs to the moment I finished reading it. I had a hard time turning my feelings into words because I felt like words would never suffice. I put off writing this review far too long and I think it's finally time for me to share my thoughts about this stunning debut from A.G. Howard. All the craziness starts very early in the book. From the moment Alyssa described her ability to hear bugs and plants, I felt like creepy crawlies were on my body, freaking me out. In fact, that's how I felt whenever I'd open the book and continue reading. Splintered was written so damn well that I got chills reading parts that were turning beautiful and scary at the same time. 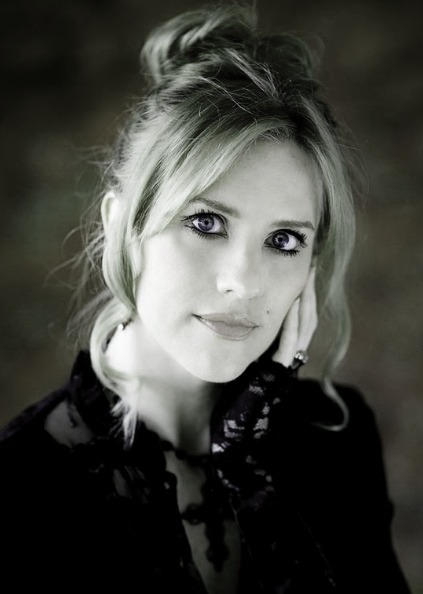 Alison falls to the muddying earth, gasping for breath. The rain falls harder, as if someone's pelting pebbles at us. Her dirt-caked fingernails gouge at the platinum cord strangling her. In her desperation, she rips some skin from her neck. Blood rises along the welts. Her eyeballs bulge, snapping from side to side as she struggles to inhale. Her house shoes slap against the muddy ground. Creepy. Too creepy...that I kept reading. It's like I had to have my fill of crazy. At every turn of the page, Howard gave me more than I expected. She described the simplest of things and turned them into lines that had me smiling simply for sounding so good. "Want it with all your heart." The command swims in my head, so quiet it's an echo from my past. "Then step inside." I'm not one to quote lines from the book on my reviews but the writing is really what charmed me in the first place. But more than that, I loved the new Wonderland Splintered offered. The way the creatures were described was phenomenal. Although some of the descriptions went overboard crazy, I still appreciate how everything was entirely different. The world building was fantastic and the twists put into the traditional Alice in Wonderland we all know today was nothing short of amazing. The story kept me up late at night on most nights and if I didn't have to go to class the next day, I'm sure I would've stayed up reading. There was so many things going on! There's a downside to that however. Inasmuch as the twists in every chapter was thrilling, I felt like there could've been less of that. Alyssa went through so many 'challenges' or 'tests' that towards the end I felt exhausted, probably as exhausted as Alyssa herself! I mean, if you have so many twists and turns it gets I-don't-know-what-the-hell-is-going-on-anymore confusing. The story also involves Jeb (the name bothers me, Filipino readers would understand), the seemingly unattainable love interest that surprise surprise actually likes her back. The girl is really the oblivious one, like how Jeb pointed out, thinking Jeb only sees her like a little sister. Intense case of denial right there! The guy went down the rabbit hole with you and is overly attached to you the entire journey and you still think he doesn't share the same feelings? "Reality check right back at ya," he says, his breath a hot rush in the chilly room. "I know you're not a kid anymore. You think I'm blind?" His fingers lace through mine, pinning my arms against the cold, smooth mirrors so our heartbeats pound against each other. "You're the one who's oblivious. Because there's nothing brotherly about the way you make me feel." On the one hand there's Morpheus, the Wonderland creature Alyssa grew up with and who for some reason acts like he has feelings for her. I get that Alyssa doesn't seem like herself in Wonderland so she does and feels all these crazy things, including feeling attracted to Morpheus. What I didn't appreciate was how Morpheus expressed his feelings - there was something off about it. It's like you knew he wasn't a hundred percent sincere but there was something definitely there. Perhaps it was the bond they shared when Alyssa was a child or it's their magical element pulling them together. I just wasn't so sold on the love angle mainly because there's it's a love triangle. I don't like love triangles that are vague or weirdly put together. But I do have to say this: I may have not liked the love triangle but if I would've had to choose, I would be on (dare I say it) Team Morpheus. There was just so much electricity between Alyssa and Morpheus whenever they'd be alone that I liked him over Jeb... despite all his deceitful ways. I'm such a hipster, I know. The book ended in what I think is a cliffhanger because it was too creepy for it not to be one. All throughout the story, I was hooked and curious, eager to know more. I'm definitely looking forward to Unhinged. Especially after seeing Morpheus' face on the cover. I just feel like more epic craziness is yet to come. What a stunning debut indeed. Her debut YA fantasy, SPLINTERED, a dark Alice in Wonderland spinoff, is now available from Amulet Books. I'm so excited about the next book! I love M so much! On the other hand I couldn't stand Jeb. I have to say that I agree with you about the writing and the creepy factor. This book was wonderful!!! Thanks for the great review and I'm glad that you finally got to read it! Nice book! Linked to the classic story Alice in Wonderland. By the way, I’ve seen its trailer and find it for more reviews from blogs and I landed here. I, too, is excited for this book and to Jeb as well – will go off to check this at some eBook deals. So why haven't I read this book? Sigh. And I know! Jeb as a name in any novel DISTRACTS me. One I read is Let It Snow by John Green, Maureen Johnson and Lauren Myracle. It's just, NO. Haha! I need to read this book stat since Unhinged's coming soon! This book is filed with fantastic humor, romance, magic, action, and adventure. It's Wonderland like you've never seen it before. I cannot do justice in sharing the beauty of this book, but it is truly marvelous. 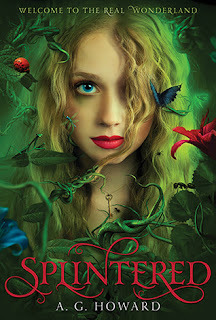 I really LOVE Splintered, and I simply cannot wait for the next installment!